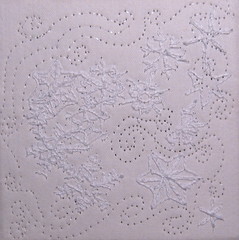 Inspired by Mr. Bentley of VT who took so many lovely snowflake pictures and the incoming weather. There is a poster of the shapes of snowflakes at different temperatures that is too lovely for words, and zipper pulls (I want one but Aerin says "spiky") and annual tree ornaments. I think I may take next week to think about things with more color(s) than the January shy, although depending on time of day and direction of view there is a fair choice of color and complexity. I love this… and the Jan 8 project. I realise I’m not saying anything very constructive, but I just do love them.